I would like to introduce you a first concept for a new Tool to help gamers to design paper Figures. This Tool doesn't pretend to reinvent the wheel, of course, but only be a specific tool for those who like paper figures and want to have all of them different each other. Build a tool to design Paper Figures starting from pre-made single body and accessories pieces. The tool will use a Drag&Drop system and take benefit from Shuffler engine. All Paper Figures will include a related back side, automatically generated by the system after completing the front side. Each single piece can be drawn likewise in a bitmap or vector format, producing a 300dpi high quality printed Figure. All works can be saved and reloaded in a second time to continue the work or shared with other users. Figures can have their single customization by moving, rotating, resizing, flipping and recoloring single body pieces and adding or modifying (in the same way of body pieces) wearing objects. Each piece will be produced with internal Magnets that attract each other to make assembling easier. A whole Figure can then be completed by an automatic black Outline, whose thickness is chosen by the user. All needed elements will be included into a single file and plugged in Shuffler to play. Phase I: First Engine Steps. In this phase a really hard work has already been done, thanks to a ready Shuffler engine and lots of coding hours. Testers can download the Extra Set #4 - Body Test and plug it in Shuffler (both Full and Demo versions work fine). At the moment you see all single pieces visible into the library and start to play with them by dragging and dropping into the canvas. Start with the Torso (the only piece to follow a snapping drop for a better alignment, but this behaviour can be changed). Then add all pieces you like by simply drop them near the Torso or other already placed pieces. Internal magnets will attract each other making everything very easy to complete. moving around the Torso will make all joined pieces move as well accordingly. Similarly each "parent" piece will make all "child" pieces move, and also rotate (Left and Right Arrow key), flip (J and K key) and resize (PageUp and PageDown Key). In this phase we can see where Magnets are placed: a little black&yellow disc indicates exactly where pieces are attracted. A new piece will be placed on a front layer but users can move it backward (B key) or forward again (H key). All chained pieces are included into the same layer as the parent, so they will be moved back and forth all together. All the other commands are explained in Shuffler Help Page. Even 28mm figures are small to see on the screen. So, you need a function to zoom in the figure to let you modify and manage the figure. Then you can zoom out again the Figure and pass to another one. The Frame includes a BackFrame: a mirror that replicates the Front image you are drawing step by step but from a Back view. So when you add a new piece, the system automatically draws the back part of the same piece and adds it exactly into the mirror side. Zoomed In feature rotates the Back side for a better view. Last, all features like move, rotation, zoom and recolor are replicated automatically to the mirror. Into the library there is also a choice of Flap Bases that join the two Figures (Front and Reversed Back). When the Flap is dragged and dropped into a Frame, it automatically takes place on the zero line, at the center of the Front Frame. This helps to be precise and fast. The whole Tool needs to be tested and stressed a lot before relaasing it. Many features could have been corrupted by the new ones. An investigation about how play all Extra Sets of Figures. Single Sets can be played by only Shuffler at this moment. This means that users need to purchase the full version of Shuffler in order to play with Figure Sets. This of course could be too much for many, not interested in making maps at all. So, following the Adobe example, it could be released a free player that let users play a single Figure Set without additional costs, and a second player with capability to mix all Extra Sets items to enjoy the most fun. Finally a third version that is Shuffler itself with all of its FX and Extra Sets included. Price of intermediate version to be determined. If you are an Artist and want to join us to give your support and take part to this new project, please send an email to info@papermakeit.com and start to have fun seeing your creations included in a new Extra Set to test. The more testers the more this Tool will grow faster and better, so don't hesitate to download all files needed and tell us what you think and what you would like to add or remove. Thank you for your precious support! Infinite Figure Designer Demo or Free Player. As many of you know, Kiladecus pushed firstly to produce such a Tool, giving his explosive and catching enthusiasm, generating thrilling ideas and creating amazing new models. After months of use of Shuffler he started to think to assemble not only 3d models but even 2d Figures with the same easy Drag&Drop system he became used to. He realized the first disassembled prototype, a black 'n white Figure made up of only five parts. Nevertheless the user was able to join them and change the color of every single piece! The system worked in a different way than the current and the Figure had a weak Magnets system (moving the Torso all around too fast made the parts lose...). After some months, Kiladecus had to face a new and bigger challenge and decided to give up for a while, just to solve a couple of personal issues. Jose Dominiguez joined then the group, as Artist, offering his talent in producing the first completed front figure, with a good variety of arms to change, armed with knive, gun, axel. 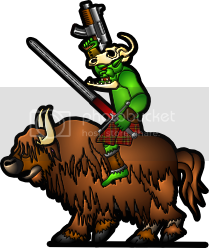 it is an Ork, whose origins seems to be Scottish. There is a basic helmet to put on and a single arm that can be left or right (remember the J key command to flip the arm). More pieces are to come soon, as stated by Jose. Currently the figure is a bitmap art, even if formerly designed as vector format. it would be easy to have it still in vector format and preserve the original quality, but now it is not necessary anyway. We need now to test the basic engine, its behaviour, to find bugs and bad procedures. Moreover we need your opinion, want you would like to see and what don't. Thank you for your attention! Thank you for the kind words, Claudio. I regret that I am unable to do more with this right now. I am glad that Jose' was able to take up the "torch" as I passed it along. I know that with the incredible skills that the two of you possess, this will be a benefit to every user. I am sorry that I couldn't continue to be more involved, and basically dropped my "baby" in someone else's lap, but I am happy to be envolved with this in at least some small way. I eagerly await all updates! Claudio, David, and Jose I'm always a big fan of your Paper Figure stuff. This looks like it could be a pretty awesome project. If I get a chance, I'll try it out, and give you some feedback. As for suggestions, off the top of my head, one of the cool features of Shuffler is being able to add in your own pieces. If we could sub in custom heads, or weapons, etc... for models that would be amazing. Yep, all you need is the SHUFFLER plug-in. One reason I loved this concept when I thought of it. Indeed with a Plug-In you can add your own images. Actually User Images are in a different format (for example they cannot include Magnets to tell the system where to insert them). So, all User Images can only be placed "over" the Figure but not joined (so if you move the Figure User Images don't follow it). We can anyway manage them in a standard way and try to suppose that the Magnet is the center of the image. Then users could fine move and replace them in a better point. The code need to be modified to do this (and hope it wont be a new headake... ...). One of the great addition of this system is that you can swap easily pieces from different Sets, so that, for example, you can have the head of an Orc on a body of a Marine. Great idea, I wonder if anyone is working on a parts set for that? This is AMAZING! Better than I imagined! Thank you Adam for your suggestion. Shuffler 2.10.4 - BETA12 has just been released with the capability to manage even User Images like Extra Set Figure Parts. As said, the system supposes the Image had only one Magnet placed to the center of the image. Has anybody tested this system? Any comments on the project? Who is so kind to offer a Set of disassembled Figures so to test more? ...Who is so kind to offer a Set of disassembled Figures so to test more? Hmm... could you prompt where I can find basic/tech. assumptions? Thank you mesper for your reply to the call.. Format: png with transparency at 300dpi or any vector format. Scale: 28mm (with vector images I need a single assembled figure in png format so to set the scale). Magnets: provide the same images with and without placed Magnets so that I can see where you want them. Pieces: free to choose. You can decide if you want arm, forearm, hand, fingers, weapon or the whole chain for example. Let me know if this is enough or you need more instruction. Thanks again. Changed the first post adding the Phase II. Now the system can manage a Frame, a sort of box where the Figure is and that can be moved across the canvas. The main feature of the Frame is to be zoomed in so to let users to manage a magnified figure. Moreover there is a panel behind the Figure to show the real height of it so to understand its final dimensions. Latest release of Shuffler is 2.10.4 BETA 13. It is a Robot (3d meshes by Regenerator Tride, Rendering by PMI). You can now change the pose of the Robot and choose one from 16 million colors separately for each part. Each part can also be resized as usually. It needs the new release Shuffler 2.10.4 BETA15 to work! Now it starts the Phase III with the most intriguing algorithm that produces automatically the Back Figure starting from the Front. I'm still seeking for Artists and Testers! Please, step on! This is SO awesome. Soon everyone can make their own figures. Some more news here! First post updated. Back Frame is working quite well (bugs always around here and there... ) after tons of hours of trying and trying again. All of you are invited to test this new phase (downloading both Shuffler 2.10.4 BETA16 and the Robot Extra Set). Shuffler 2.10.4 BETA 17 is up and running with tons of bug fixed. If you like it, you can download the High Resolution image here and print it at 300dpi. It is a 40mm tall Robot. Of course all parts can be moved, resized, rotated, mirrored, recolored. I am working on finishing a couple of projects, but plan on diving into this soon! I have got to have to killer robots! A new BETA release is available with several bugs fixed (but still more hiding..). Another BETA release with most of bugs fixed. I have no special skills so I can't help. But I am interested in the product. Is planned a time for the commercial release of the finished product? But now I can see the end of the tunnel and only one main bug needs to be fixed (the EditTool). Then I'd like to revise the Palette Color Tool to let users increase the productivity when changing the color of a figure made up of many different pieces. The first Figure Set by Paper Make iT ! will be suitable for Space Base maps: Aliens and Space Squads and released probably in September or even at the end of August if I don't encounter any particular troubles to complete the Tool. after an infinite amount of time, finally it seems the work is over ;D (or at least for now before other bugs hunting... ). You can download the latest BETA21 and test it fully. All your issues reporting is welcome! Single Sets of Figures can be played by only Shuffler at this moment. This means that users need to purchase the full version of Shuffler in order to play with Figure Sets. This of course could be too much for many, not interested in making maps at all. So, following the Adobe example, I thought to release a free player that could let users play a single Figure Set without additional costs, and a second player with capability to mix all Extra Sets items to enjoy the most fun. Finally a third version that is Shuffler itself with all of its FX and Extra Sets included. Currently Shuffler price is $15.90. What should be the price of intermediate version? Those of you who aren't familiar with SHUFFLER, it is THE most useful program (next only to EXCEL, but there are days they are even)! You can do almost anything with this and your imagination is the ONLY limit (even that can be stretched with Claudio's BRILLIANT design and coding). I CAN NOT STRESS ENOUGH HOW WONDERFUL THIS PROGRAM IS!!!!!! ;D ooohhhh..... too kind! Thank you very much! There are still a couple of things to add here... first of all an automatically added black outline with user set thickness. This is an infinite project.... I was just releasing it when suddenly I realized that something was missing.... the OUTLINE!!!!! How could I miss an automatic Outline? How was I able no to even think to this MUST HAVE feature? Each Figure needs a black Outline to print and make it easier to cut out the whole Figure. So now users can choose to add or not a black Outline and even to choose the thickness. It is up to you! To activate the Outline, select the main part of the Figure (generally the Torso) and then press T key. Then you can increase (T) or decrease (F) the thickness. That's all! Simple as usual.. Moreover, if you need to modify your Figure the Outline on the fly modifies itself according to the new shape... try it!